Q: How can GuideReader help me as a person with sight loss? 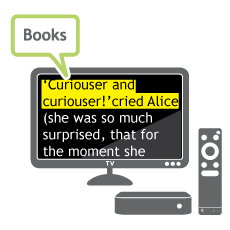 A: GuideReader has been designed for people with sight loss, by people with sight loss. Everything in GuideReader speaks and the instructions are simple and easy to understand. Plus you can change the voice – there’s 3 to choose from. Unlike most mainstream book readers, GuideReader lets you enlarge the book text as big as you need it. You can change the text colour and page colours to a combination that offers you the most contrast. GuideReader is the culmination of 30 years of expertise making products for blind and partially sighted people. Q: I am not good with technology, can I really use GuideReader? A: Yes. GuideReader has been designed to suit people who don’t use computers and aren’t confident with technology. The step by step talking menus guide you through choosing, downloading and reading books and newspapers. We’ve kept everything jargon free too, so there’s no complicated ‘computer speak’ to get to grips with. Q: What is GuideReader Pod? A: GuideReader Pod is a small box that either plugs into your TV or can be used as an audio device. It enables you to access your libraries to browse, download and read audio books. GuideReader Pod is controlled using the Dolphin Remote to move through the talking menus and select the options you want. Q: Does GuideReader only read books? A. No. GuideReader gives access to books, newspapers and magazines. Each library offers different materials. Different libraries are available in each country. Explore the complete list of libraries and the content they offer. Q: Which libraries does GuideReader connect to? A: GuideReader connects to different libraries in different countries based on their availability. In Sweden MTM and Legimus are available. In the US Bookshare and NLS BARD. Visit the GuideReader Pod product page to explore which libraries are available in your locality. Q: Do I need library membership? A: Library membership is not essential, but definitely preferred. To get you started we’ve included a few good books so you can start reading as soon as your Pod is out of the box. GuideReader also includes direct access to Project Guttenburg and EpubBooks. Both libraries offer unrestricted access to their huge selection of books, but they are primarily classics that are out of copyright –more than 50 years old. If you are looking for the latest best seller, we definitely recommend signing up to your local or national accessible book library. Most are free to people with sight loss, but do require you to become a member. Q: I receive books via the post on USB Memory stick. Will these read? Q: Where is GuideReader available? A: At the moment GuideReader Pod is only available in the US and Sweden. Both editions are due to be released in the UK, Australia and Norway before the end of the year. Q: GuideReader doesn’t appear to be available in my country at the moment, but I am interested. What can I do? A: If you would like to be kept up to date with latest release information, sign up for our mailing list. Q: Where can I try GuideReader? A: GuideReader is brand new and we are currently working with local blindness societies and visual impairment groups to place trial units across the country. Contact Dolphin or your local GuideReader Dealer to find your nearest GuideReader that can be trialled. Q: What help do I get with GuideReader? A: GuideReader is super simple to use but to make sure you’re super confident, we’ve included lots of help to get you started. Interactive or hands-on mini tutorials are included and literally guide your fingers through the basics. Plus help information is instantly available at any moment and is written for the exact place you find yourself, so you can never get lost or confused. You’ll also find a getting started guide in the box. Q: What support resources do you have that I can share with my family? A: There are a host of video tutorials on our website that demonstrate some of the most popular GuideReader activities and questions; subjects like ‘Connecting to the wifi’ and ‘Dolphin Remote basics’. Q: Do I need wifi? A: Yes, but only to browse and download books. Once your book is downloaded no internet connectivity is required. Most of our customers have wifi in their own home, but some choose to browse and download whilst at their family’s house using their wifi connection. Q: What warranty comes with GuideReader? A: GuideReader includes a 1 year warranty.